The Bell UH-1 Iroquois is a single-engined, twin blade, medium-lift utility helicopter in extensive use with the U.S. Army and also used by many militaries around the world. The UH-1 was developed specifically for U.S. Military service are used mostly in the transport role as well as search and rescue. A civilian version, the Bell 204/205, has also been developed, as well as a twin engined variant, the Bell UH-1N Twin Huey. 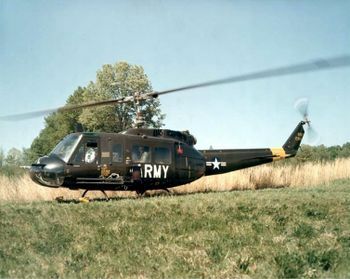 This page lists all films that feature a variation of the Bell UH-1 Iroquois. For the civilian version, see Bell 204/205. For the twin-engined variant, see Bell UH-1N Twin Huey. Pages in category "Bell UH-1 Iroquois"
This page was last modified on 25 June 2017, at 18:12.